It was interesting to see all the talk today about Apple updating their Cards app. 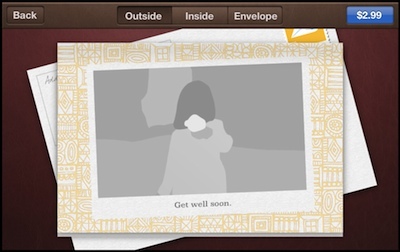 The app is for making cards that Apple then prints and mails for you, just like you can do with iPhoto on your Mac notebook/desktop. 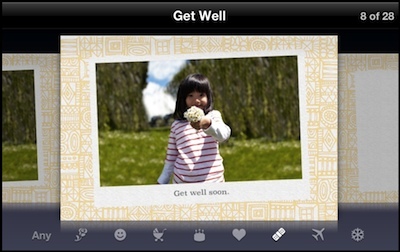 Like the desktop version, you create the cards using Apple’s templates, using your photos. You can edit the text to personalize or leave it the way Apple offers. When you have the card the way you want, you upload the card to Apple, pay $2.99 (for anywhere in the USA, international is more), and Apple will print/mail for you. While the ‘Cards’ app for iOS is not Universal, it works fine in 2X mode on the iPad. 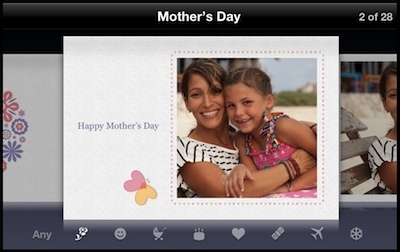 Today’s update from Apple has templates added to Cards for Mother’s Day and for Get Well. This update means you are covered for remembering your mom, saying thanks, birthday wishes, send Love, holiday cheers, baby congrats, and share travel fun.